While the Indonesian army continues to dominate the indigenous inhabitants of West Papua, three friends gather in Melbourne to record outlawed folk songs with renowned Australian rock musicologist David Bridie. Donny Roem is a recent exile. With his two young brothers and forty-two other refugees, he crossed the Arafura Sea to Australia in a homemade canoe. 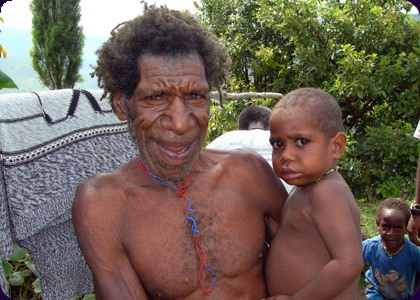 Jacob Rumbiak was a child soldier in the West Papuan resistance movement. His moving story is one of oppression, torture and escape. Charlie Hill-Smith, an Australian writer, cartoonist and comedian, is their friend. His passion for contact across cultures has led him to forge close friendships with the Melanesians and the Javanese families he met as a teenage exchange student. Afloat in an extraordinary musical tradition from the West Papuan highlands, hearing stories of escape, oppression and exile from Jacob and Donny, listening to the defiant songs of murdered musician and independence hero Arnold Ap, Charlie confronts a basic question: how could these two vibrant cultures be at war and how can the rest of the world seemingly not care? Charlie travels again to West Papua and visits the places Donny and Jacob still call home. He records the fate of West Papuans trying to maintain village life while adapting to the Indonesian economy. He visits the battered, pitiful resistance and the refugee camps along the Papua New Guinean border. In the end, Charlie is inspired to blend his own journey of discovery with scenes of the studio recording to create an extended musical meditation. Charlie Hill-Smith is longtime writer and director. His body of work includes: The House of Red Monkey, Making of Ten Canoes (feature documentary), Indonesia—Art, Activism and Rock n’ Roll (documentary), Red Monkey Comedy (sketch comedy pilot), Under Ground Art (short documentary), Nine Steps (music video), Wokabaut West Papua, The Making of Sample People, Ben Folds Five Australian Tour (music documentary) and Hong Kong Fooey & the Great Chinese Takeaway.